Here we go again, first day after the pause, I think four days on and one day off might be a pattern worth using as the legs were really good today. I did not leave in a hurry this morning. 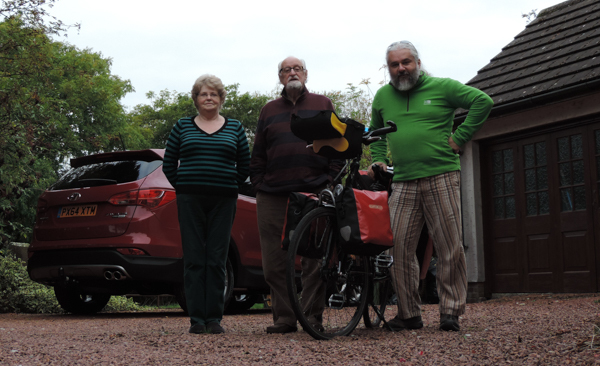 Just after ten was bye bye time and, after a group picture with Norman, Muriel and their shiny new car it was back to pedalling. Don’t you think that’s a fabulous shade of red? Norman and Muriel are excellent hosts and I enjoyed every minute I spent with them. I’ll be back to see them once the first stage is completed, but for sure not on pedal power. After leaving Kirkbride I headed into the hills, the climb was moderate but continuous. I made good time into Keswick. Lunch brought to my attention that there is enough salame for only one or two lunches, if I’m conservative with it, what will I do when I finish it? panic is setting in. 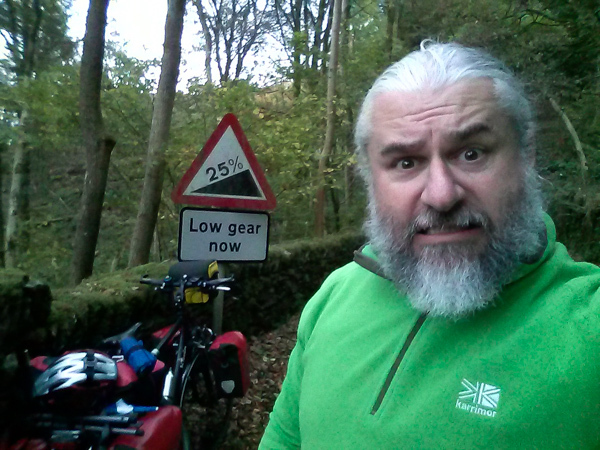 The ride out of Keswick was very steep (look at the profile around mile 26). I managed on the bike but the minimum gear was pretty permanently on. I am starting to think that I’d be better off if I moved lunch at mile 30 rather than 25, afternoon legs are definitely a lot less spry than morning ones. After the steep ascent there was a long and very scenic rolling hills road and then an extremely steep descent into Grassmere. The village is lovely and, despite it only being two miles to the Hostel, it called for a stop, a coffee and a flapjack. The calories boost was actually, in hindsight, an inspired choice. “It’s steep!, you might have to dismount, but don’t worry the bad bit is only 500 yards”. Let me first tell you that the there is a problem with the road sign below. The angle that it depicts is actually more than 25%. It looks just shy of half the triangle angle which would be 30º and therefore more like 50% incline. Me at the bottom of the wall of death. The number is right and the picture is wrong (most likely explanation). The rationale behind that would be that the sign is a standard template and the only thing they change is the number, or they want to scare the big Jesus out of the incoming travellers with subliminal imagery. The number is wrong and the picture is right. I don’t think this is the case but I can tell you it is what my body was telling me all the while I was pushing all 50Kg of loaded bike up the slope. I know of only another 25% slope (here) which I experienced with the car, and let me tell you, the two experiences do not compare. Anyways, all is well now, staying in Elterwater Hostel in a 6 berth dorm, haven’t done that since New Zealand 1999. Most of the people here are hiking rather than cycling, but I have struck up a couple of conversations and I’ll soon be tucking into a lovely canned sardine dinner followed by a dose or two of the “water of life” i procured today. It was lovely to see you yesterday. Muriel mentioned there was a photo, she was not amused you were putting it on the website but you have captured them both her & Norman well (Muriel never takes a good photo) but I think she will be happy with this one. Oh and the car is a fabulous colour! We will be with you in spirit on your travels & continue to enjoy your blogs. I don’t remember but it is possible. Dai miei ricordi di scuola guida la pendenza del disegno sul cartello è standard…almeno in Italia dove l’esattezza non è proprio di casa. Davvero hai già messo quei calzoni…e in un’occasione mondana?